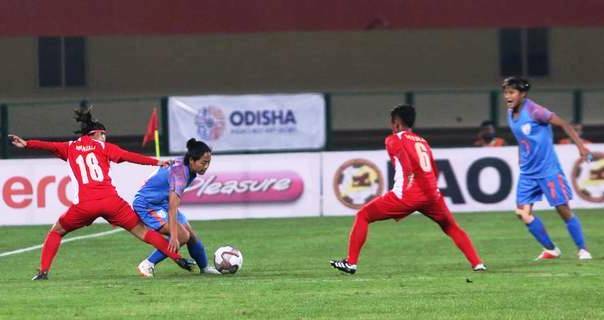 Bhubaneswar: After an emphatic win against IR Iran, India bowed down to Nepal 2-1 in their second game of the Hero Gold Cup 2019 at Kalinga Stadium here on Monday. Nepal forward Sabitra Bhandari’s brace took the team past India. She struck her first goal in the fourth minute and scored the second two minutes later to give Nepal a 2-0 lead. After numerous missed chances, India’s Ratanbala Deviin scored in the 83rd minute, a little too late to get back in the game. In the other clash of the day, Myanmar defeated Iran 2-0 to remain at the top of the table with six points from two games. While India and Nepal are locked in second place with three points each, Iran is yet to open its account.